IMPORTANT NOTE: Following the recent ruling of the Supreme Court that the central data sharing of the provisions of the Named Person scheme are illegal, the Scottish Government will be required to make substantive changes to the legislation if they wish to go ahead with the scheme. This page will be updated if a new version of the scheme is submitted. The Named Person law orders health, education, police and other bodies to send private information about children’s wellbeing to the Named Person without any reference to parental consent or knowledge. 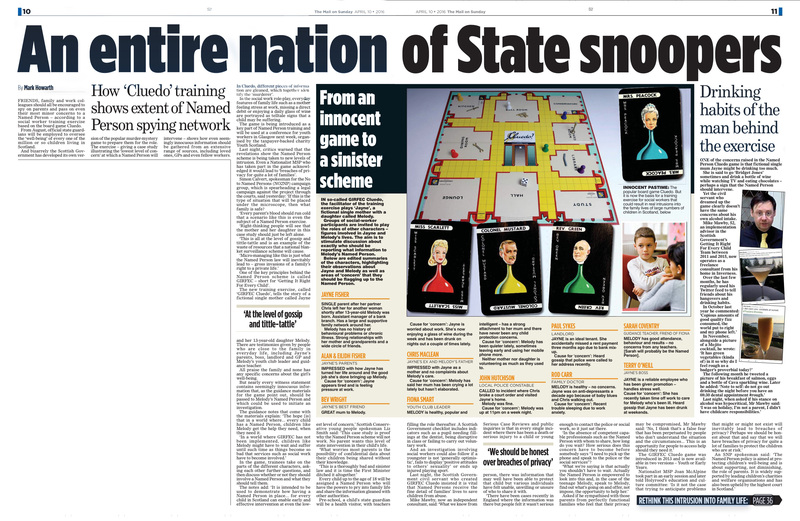 A Scottish Government training tool based on the game Cluedo, calls for “effective intervention at even the lowest level of concern”. It says friends and landlords should feed information to the Named Person. ‘Information’ like a parent being “worried about work” or “enjoying a glass of wine during the week”. Named Persons will be collecting information all the time, regardless of whether or not a family needs help. Prying into private family life is not ‘help’. Sometimes politicians and judges get things wrong. That’s why parents are trying to persuade politicians to think again. Many have changed their minds already. It’s also why the case has been appealed to the UK Supreme Court. No, that is not all a Named Person does. Why legislate to give Named Persons powers to obtain and share data and the authority to act “where the named person considers it to be appropriate” if they are merely reactive to parental requests? ‘Not taking advice’ is one of the 200 risk indicators that Named Persons will use to assess families. It earned the parent of one child a black mark in a 60-page dossier secretly compiled by his child’s Named Person. The law says the Named Person can act “where the named person considers it to be appropriate”. It says nothing about parental consent. Nor is there any opt out. To achieve the Government’s own goal of “making sure something is done”, the Named Person has to have power to overrule parents. Named Person law orders health, education, police and other bodies to send private information to the Named Person about children’s wellbeing without reference to parental consent or knowledge. Those examples come from Government-funded leaflets. The huge amounts of new data gathered under the Named Person scheme will inevitably result in over-referrals, burying the files of genuinely at-risk children under a mass of trivia on ordinary families. Health Visitors, who are forced to act as Named Persons for under-fives, say they risk being consumed by an “avalanche” of information which could “clog an already stretched system”. Some innocent families will get caught up in the child protection system. Independent social work consultant Maggie Mellon says if parents say they do not want a Named Person this would be regarded as a risk and would move the family into child protection investigation. How can it take eight pages of statute to create something which ‘isn’t new’? If it isn’t new, why do Health Visitors say it will “totally change my job”? The definition of wellbeing is the problem. Clan ChildLaw says the wellbeing threshold “involves a highly subjective judgment on the part of the Named Person and others as to whether to share information”. This is simply untrue. The Named Person information sharing provisions in the Act say absolutely nothing about telling parents what is being shared and why. If it is “likely to be relevant” to the Named Person and “ought to be provided” then it “must” be shared. Government guidance to Health Visitors actively discourages professionals from seeking consent, saying sharing of information with or by a child’s Named Person “will be a duty even where there is a duty of confidentiality”. It even says “consent to share relevant and proportionate information in this context will not be required and if sought and refused could potentially damage the HV/parental relationship”. Kayley Hutton only discovered that her Named Person had compiled a 120-page dossier on her and her daughter Kaiya when she made a Subject Access Request under the Data Protection Act. No, the current law does not allow that. The current threshold for information sharing is “risk of significant harm”. The Information Commissioner’s Office say the Named Person law is “lowering that trigger down to wellbeing”.